Marathon Eve Update | (m)EAT LESS, RUN MORE! My outfit has been selected and I’m ready to go. Now I’m just hoping the weather cooperates. We’re currently under a heat advisory, and the course time limit has been lowered from 6.5 to 5 hours. 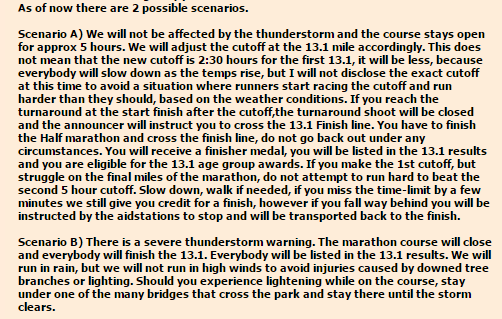 That in itself isn’t such a big deal as I’m planning on around a 5-hour finish time. So while it’s more than likely I’ll be stopped at the half, I’m not going to change my race day strategy. I’m not going to kill myself by trying to beat that “undisclosed” time; I’m just going to enjoy myself (as much as that’s possible in 90+ degree temps ;)) and whatever is meant to be, will be. ← 3 More Sleeps til Marathon! Fingers crossed you get to finish the full but at least you’re being realistic. Are you wearing the PF2s? Here’s hoping you can stick to that plan. I’m sure I should’ve started much slower for my half, but having already done a hot, hilly one, I thought I knew what I was capable of. I’m betting you finish the full, barring thunderstorms. Don’t forget about race day adrenaline! Really impressed you’re already ready for another! I’m not really worried about going out too fast because I’m doing intervals. I am worried about whoever is behind me as I run/walk every 30 seconds! I’m going to try to stay as far to the edge of the path as possible. The people the run or run/walk or walk three across are the bane of my existence. I’m facing the threat of storms on my race morning as well. Unfortunately, we can’t control the weather. Like you, I’m going to my race on Sunday with the attitude that I will run and have fun! We’ve done our training and we survived, so if for some reason we can’t finish the whole marathon due to weather, we know we can do it again! I’m so excited that you’re going to do another race in November! I haven’t decided if I will do another one this year, but I will definitely do another next year; in fact, I seriously would like to try to get into the Chicago marathon! But….one marathon at a time, eh? I’m going to tell you a thousand more times before the day is through, but GOOD LUCK TOMORROW!!!! That’s right – no controlling the weather. What were we thinking signing up for June marathons?! Lol! Yes, one marathon at a time! And thanks my friend :) I can’t wait to cheer for you on Sunday!! !